SpinCar makes it easier for buyers to bid on cars remotely. 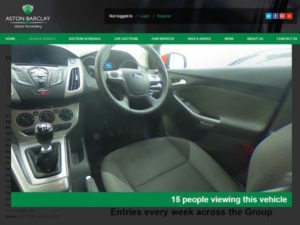 The product gives buyers a 360-degree view of the used car’s exterior and interior with a zoom facility, enabling them to inspect cars closer online and aiding with bidding decisions. Already live at Westbury and Donington Park on all fleet and dealer inspections, SpinCar will eventually replace Aston Barclay’s current imaging software across its five-branch network. “We know from experience that high quality images are critical for online and mobile buyers when they are buying remotely. Buyers will particularly welcome the zoom facility which enables them to carry out their own detailed due diligence on a car’s condition prior to a sale,” said Aston Barclay’s group IT director Stewart Ford. The initiative is the latest in the company’s ongoing rollout of its digital remarketing strategy. Earlier this year the group received a multi-billion pound investment following a management buy-out, with areas of investment including IT and Aston Barclay’s new Donington Park Mega Centre that opens this week.For more of the latest industry news, click here.